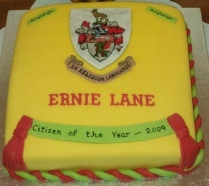 In recognition of his substantial contribution to many aspects of life in Rayleigh for over 55 years Ernie Lane, our President, will be formally awarded the title 'Rayleigh Citizen of the Year 2009’ at the AGM of Rayleigh Town Council to be held at the Mill Hall on 22nd April 2009 at 7.30 pm. 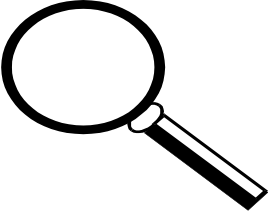 Here are some of the reasons why….. He has played a prominent part in the life of Rayleigh since his family moved here in 1920 (aged 2). A pupil at Love Lane School he joined the 1st Rayleigh Scouts in 1926 and rose to become both Cub and Scout Master. After joining the Territorials in 1937 he had a distinguished war record culminating in being the Staff Captain and Major in the port and town of Preveza in Greece. On returning to Rayleigh at the end of the war he joined the Financial Times group holding an executive position with the Investor’s Chronicle until his retirement in 1982. It was in 1950 that he commenced his local voluntary work by raising the funds and materials to build a footpath to enable the elderly residents of Eastwood Lodge access to the Eastwood Road and beyond for the first time. 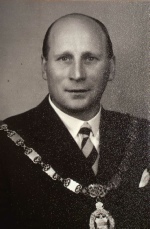 He was elected to the Urban District Council in 1953 serving on all committees and becoming its Chairman in 1960. The first Chairman to be invited to a Royal Garden Party in 1961. Chairman of the last (to date) town carnival in 1957. Heavily involved in local schools as Governor of Sweyne and Manager of both Grove and Love Lane schools. It was as Chairman of the Love Lane PTA that he masterminded the building of the sports pavilion and swimming pool for Love Lane which was opened in 1961 by the Olympic swimmer Ann Long. 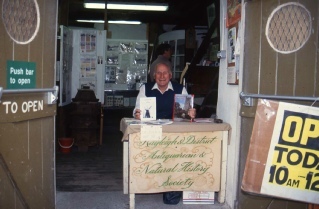 His extensive knowledge of Rayleigh was put to good use in 1991 when his first local history book ‘Rayleigh a Pictorial History’ (with Edward Fitzgerald) was published and this was followed in 1996 by his 2nd book ‘Rayleigh Its People and Places’. All funds raised from the sale of these books, and the 96 slide shows he subsequently gave to local groups and associations, were donated to local charities and good causes. Ernie has been a consultant and adviser to Rayleigh Town Council for many years, most recently with regard to the erection of the town’s heritage plaques.